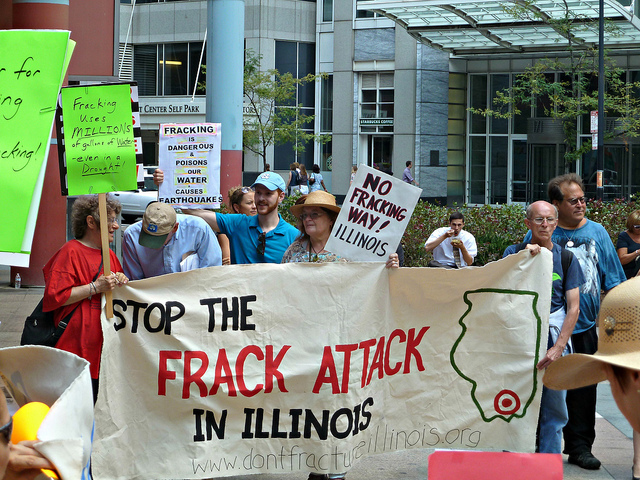 Activists rally against fracking outside the Thompson Center in July 2012. In a revision to its sweeping inventory of the nation’s greenhouse gas emissions, the Environmental Protection Agency scaled back its estimate for natural gas, stoking supporters’ claims that the fossil fuel could be a viable carbon reduction strategy in the short-term. But those pushing for a ban of the controversial technique of high-volume hydraulic fracturing, or fracking, say the data are still unclear and that EPA’s revision doesn’t change the big picture. The Illinois legislature is at a crossroads on fracking as members prepare to vote on bills that would either regulate the process or ban it entirely for at least two years. Natural gas is mostly methane, a greenhouse gas 21 times more potent than carbon dioxide, according to EPA standards. Mining and distributing the gas involves some leakage, but the amount that escapes is a point of contention. Supporters contend if methane leakage is contained, the fossil fuel burns about twice as clean as coal. Some say it could serve as a bridge to an electricity grid dominated by renewable energy. Using new data largely reported by oil and gas industry groups, EPA’s report lowered its estimate of methane emissions from natural gas between 1990 and 2010 by about 20 percent. Previous studies, however, have calculated figures that appear to torpedo its viability as a comparatively low-carbon fuel. The EPA’s latest inventory comes ahead of work from NOAA scientists and the University of Texas at Austin studying natural gas emissions on a national scale. Their results are expected within a year. Most of the data currently used to estimate methane leakage don’t come from field tests done at real wells, which has led some to question their worth. Hugh MacMillan, a senior researcher with Food and Water Watch, says EPA raised its estimate of 2010 emissions from fracking itself at the same time that it drastically lowered emissions from another part of the process. "EPA is making large changes in how it’s arriving at these estimates, and that means there remain large uncertainties," MacMillan said. Food and Water Watch, like many environmental groups, supports an outright ban on fracking. A 2011 study by the Center for Atmospheric Research found methane leakage would have to be below 2 percent to beat coal when it comes to reducing greenhouse gas emissions. Using EPA’s 2013 and 2012 data to calculate methane leakage, a new report from the World Resources Institute found the recently revised numbers produced a leakage rate roughly one third lower than the agency’s previous estimate — a figure below that 2 percent threshold. Even if the lower methane figures prove true, MacMillan is against fracking. "&apos;Better than coal&apos; is not an acceptable measure," he said. "We need to do more to fight climate change." System failures can have effects beyond accelerating global warming. Cement well casings cracked in Dimock, Penn., where methane contaminated some nearby wells, according to the state government. And while aquifers are separated from gas wells by thousands of feet of rock, environmentalists worry small fissures in the cement could over time cause failures and foul drinking water. During fracking, large volumes of water flow back to the surface along with the freed oil or gas, and they are laced with naturally radioactive minerals and proprietary chemicals. Industry experts counter that wasted gas is wasted product, and that new technology will continue to tamp down leakage. In March, Illinois legislators moved toward a vote on a regulatory bill called the Hydraulic Fracturing Regulation Act. It would set up regulations and permitting for fracking. Negotiations over the regulatory bill hit a snag when oil and gas companies objected to natural resource extraction fees and a surprise amendment that would create a licensing board. It would require energy companies to hire a state-licensed water well driller in order to be licensed for high-volume fracking in Illinois. Lawmakers could also back moratorium bills in the state house and senate, which call for a two-year ban on fracking so scientists and regulators have more time to study and prepare for the industry explosion that’s likely to take place. Fracking and horizontal drilling in general are old technologies, but recent advances have allowed them to be used together and on large scales. There are already about 500,000 acres leased mainly in Wayne, Hamilton and Saline counties in southeastern Illinois. The right conditions could go as far north as Jasper and Effingham counties. Fracking grew in the U.S. by at least 48 percent per year in the last five years, according to the Energy Information Administration.